The company will demonstrate its hospitality technology platform as it looks to expand European footprint. “The European market is looking for solutions that the INTELITY platform provides, including ways to increase their connectivity across property and streamline daily operations," said David Adelson INTELITY President and COO. 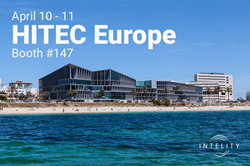 INTELITY™, the provider of the broadest enterprise guest engagement and staff management platform for hospitality, will be attending HITEC Europe which will take place in Mallorca, Spain this April 10-11. HITEC Europe is part of the world’s largest hospitality technology conference brand, which brings leaders and professionals together to cover the latest trends specific to the industry. The INTELITY platform offers a complete suite of tools that create a seamless connection between hotel guests and staff. The platform integrates with over 120 operational systems including PMS, POS, room controls and loyalty programs through INTELITY Connect. Features like mobile check-in and mobile key solve some major challenges European hoteliers face today. Other solutions include multilingual digital access to amenities and services, TV casting, and much more. Using INTELITY Staff, management teams have access to advanced business intelligence tools to gain actionable insights into guests behaviors and preferences. The INTELITY platform is currently in use in more than 200,000 rooms across the globe. Email demos(at)intelity.com or visit our website to schedule a time to meet with a member of the INTELITY team at HITEC Europe.